Newly-updated with a digital book CD for Interactive Whiteboards!Pattern blocks can remain a powerful teaching tool for middle school students. Using pattern blocks and the activities presented in this book, students tackle: fractions and equivalence,line and rotational symmetry,classifying polygons,area and perimeter,patterning,probability,angle measurement, algebraic equations, and much more! This comprehensive resource has 60 activities including blackline masters, teaching instructions, connection to math standards, and additional explorations. The activities are organized into sections that address the key math strands as recommended by NCTM. 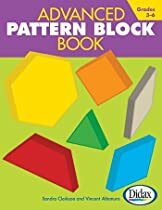 The accompanying CD includes a digital edition of the book and virtual pattern blocks that can be dragged, dropped, rotated, and flipped, making the activities fun for the whole class!140 pages.